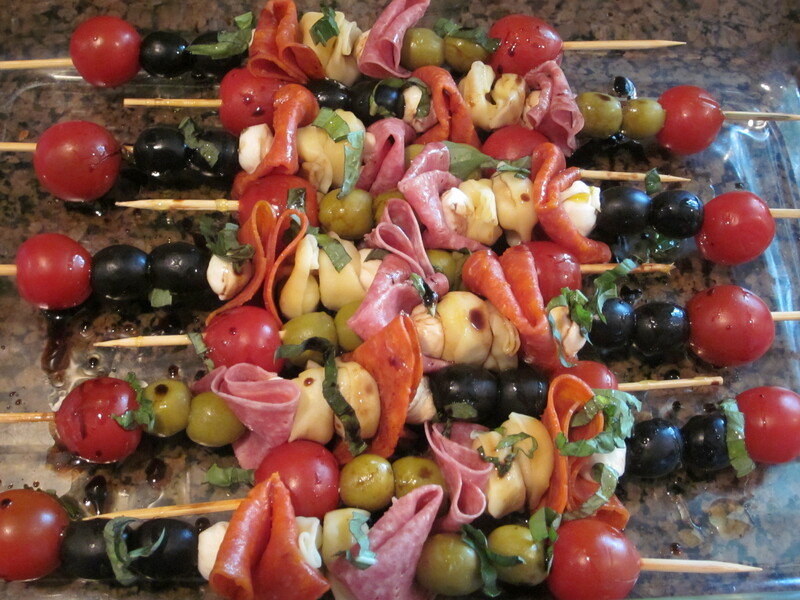 Antipasto Kabobs | This Girl’s Gotta Eat! This great idea was brought to us by….you guest it…Pinterest! Of course I had to make a few tweaks of my own. Brought these to a Labor Day cookout this weekend and they were gobbled up in no time! Cook the tortellini to al dente, according to the package instructions. Drain, and let cool. To build the skewers, I used a tomato, two black olives, a mozzarella ball, piece of pepperoni folded, two tortellinis, another mozzarella ball, piece of salami folded, two green olives and finally another tomato. Top with sliced basil. At this point you can cover tightly and store the skewers in the fridge for a few hours. Before serving, drizzle the skewers with some olive oil and balsamic vinegar and season with salt and pepper to taste.